This leafleting task was conducted while dressed in a (slightly ill-fitting) rented skunk costume (Das Stinktier) complete with a hand-written sign: DAS IST ECHT! (THIS IS REAL!) The leaflet was intended to add to the innumerable flyers, leaflets and other informational ephemera a visitor can expect to accumulate in the course of a day at Expo. The action was interrupted by an Expo employee and security personnel as ‘not being in the interest of Expo,’ and also on the grounds of not having official registration and identification documents. 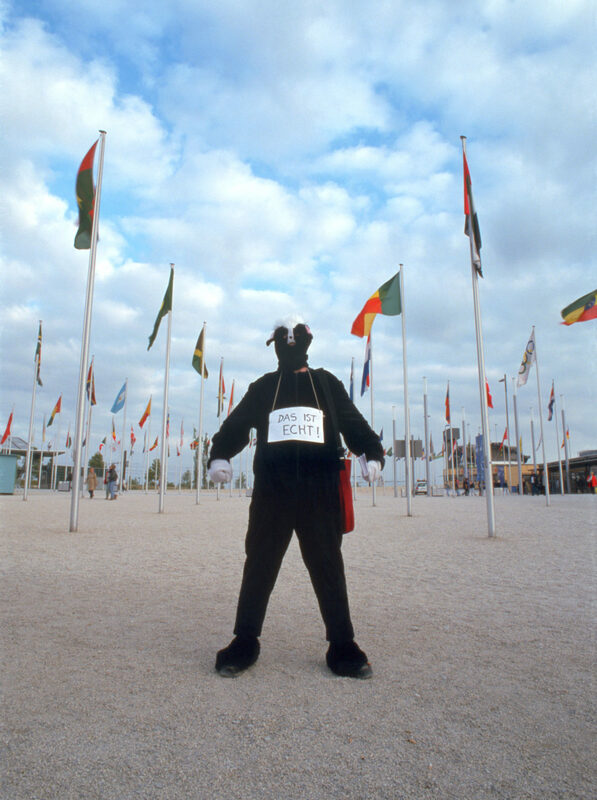 Following an unsuccessful attempt to have the artist arrested by the police, he was ejected from Expo property. 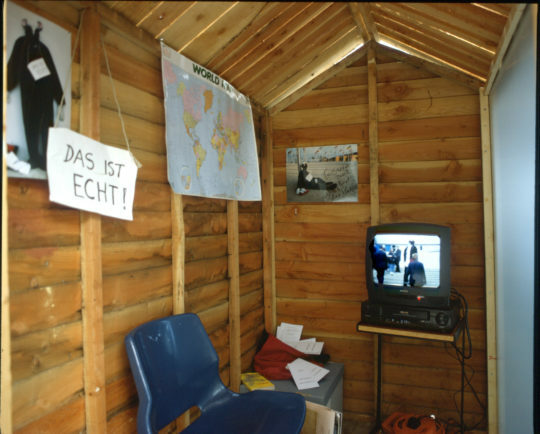 This work was realised during artist’s residency in at the Ireland Pavilion Expo 2000, Hanover. 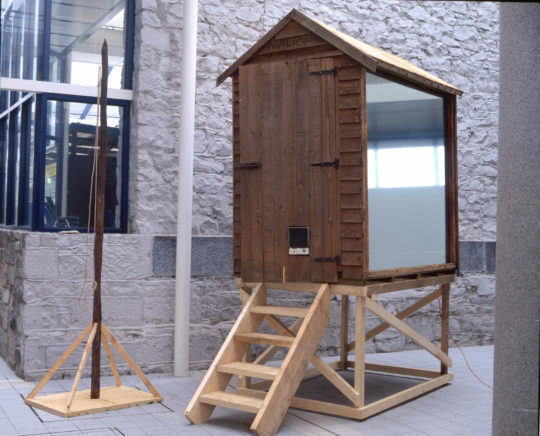 The following year the material was exhibited again at EV+A 2001, Limerick, Ireland, curated by Salah M. Hassan, this time presented in it’s own “Pavilion.” – a specially modified second-hand garden shed. The shed was elevated on a platform, with steps for access and one wall was replaced will floor to ceiling frosted glass. 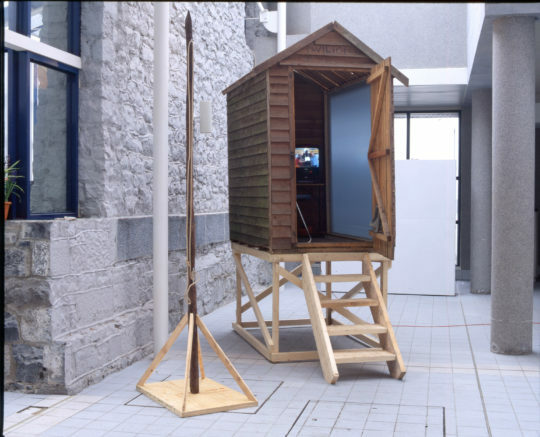 In adition a flag-pole was positioned outside the “Pavilion”, which was sited in Limerick City Council Offices. Installation of Das Ist Echt! documentation material in the ‘Pavilion’ at Limerick City Hall, EV+A 2001. 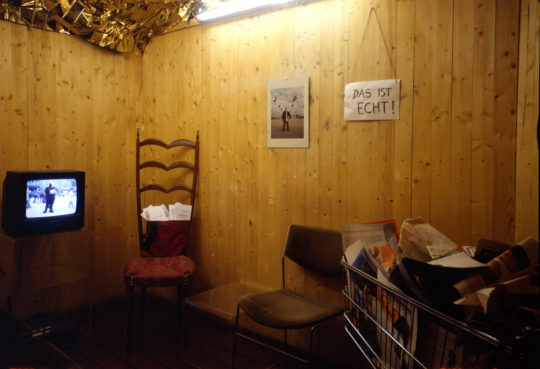 Interior view of installation of Das Ist Echt! documentation material in the ‘Pavilion’ at Limerick City Hall, EV+A 2001.